The National Hockey League season is in full swing and teams are already feeling the sting of injury. Unfortunately, the Philadelphia Flyers are no exception. On Monday, it was announced that forward James van Riemsdyk would be out for five to six weeks after suffering a lower-body injury. In just the second game of Philadelphia’s season versus the Colorado Avalanche, JvR wasn’t seen again after the first period, only playing a mere five minutes and thirteen seconds. According to Broad Street Hockey, van Riemsdyk was hit on the inner part of his right knee by a clearing attempt from Colorado’s Mark Baberio. An unfortunate placement of the puck seemed to do its damage as the winger left the game shortly after. Signed in July as one of the NHL’s top free agents, the former Toronto Maple Leaf rejoined the Flyers after being traded six years prior. He was brought back to Philadelphia to bolster the team’s top six forwards as well as their power play. van Riemsdyk is considered a top net-front presence in the league who put up 20 power play points (11 goals, nine assists) last season. Now, as the 29-year-old is sidelined, the Flyers will need the all important next man up to hopefully fulfill the void. As for that next man up, it looks like it’ll be Jordan Weal. He hasn’t seen any game action so far this regular season, yet it’s likely he’ll slide into the third line, left wing slot where van Riemsdyk was prior to the injury. 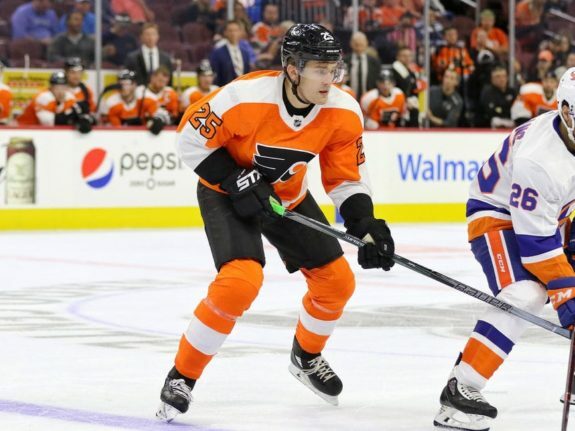 The 26-year-old played his third season with Philadelphia in 2017-18, posting a career high, yet disappointing, 21 points (eight goals, 13 assists) in 69 games. Paired with rookie Mikhail Vorobyev and Wayne Simmonds, Weal will have a good mix of young and veteran talent on his line. In turn, the move could spark a new fire in him as fans have had high expectations of the forward ever since his arrival to the team. Coming into the lineup in place of a star winger leaves big skates to fill for Weal and he’ll have to live up to the hype. 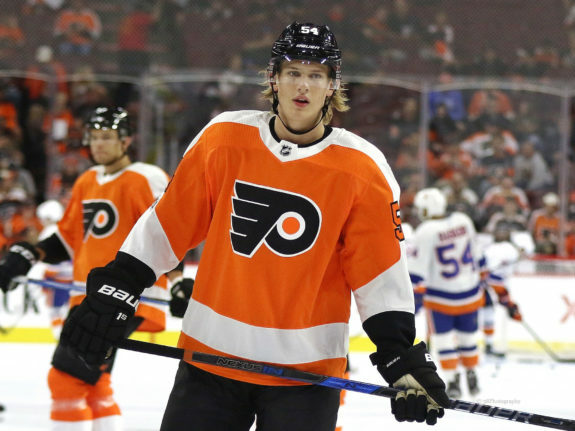 On the power play side of things, young forward Oskar Lindblom is slated to take van Riemsdyk’s place, according to Philly.com’s Sam Carchidi. 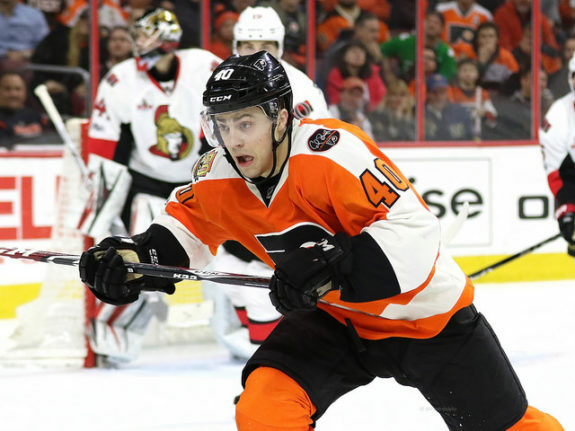 Lindblom is in his second season as a Flyer after playing 23 games with the club in the latter part of last year. His short time with the team saw him post six points, one of them being an assist on the power play. The 22-year-old winger hasn’t had any power play tallies this season, but did score a nifty goal in Philadelphia’s season opener against Las Vegas. Once again, there are big skates to fill with JvR’s absence on the man advantage. However, expect Lindblom to rise to the occasion. In general, the Flyers’ special teams offense will have to step up its game. Currently, they sit in a tie for the 17th spot in power play percentage at 14.3 percent. It’s not yet a cause for concern, though, with just a handful of opportunities just two games into the season. But, as mentioned earlier, van Riemsdyk was brought in to help with Philadelphia’s power play struggles. The team ended last season in the No. 15 spot in power play percentage at 20.7 percent, and made it an offseason goal to improve. Throughout the Flyers’ lineup, the next man up mentality is now alive and well. Veteran players like Claude Giroux and Jakub Voracek, as well as young talent like Nolan Patrick and Travis Konecny will need to lead the way on offense. On the blue line, stars Shayne Gostisbehere and Ivan Provorov will need to contribute offensively, too. Until van Riemsdyk’s projected return in mid-November, Philadelphia’s depth will be put to the test in more ways than one.